Plantar Fasciitis and Other Heel Pain | Podiatry Associates, P.C. ?Why do I have a sharp, stabbing pain in my heel? Why do I have a sharp, stabbing pain in my heel? Sharp, stabbing heel pain can be caused by a number of different conditions, but the most common one is plantar fasciitis. Plantar fasciitis is a problem with the ligament that attaches to the bottom of your heel and runs the length of your sole. Too much pressure, overuse, and hard impacts over time can overstretch and damage the ligament. It becomes irritated, swollen, and tightened. As a result, when you take a step, you make the damage worse. You’re left with a sharp, stabbing pain in your heel—particularly first thing in the morning, or after you’ve been on your feet for a while. Plantar fasciitis, like other heel pain culprits, doesn’t get better on its own. You’ll need to intervene with active treatments to help alleviate the irritation, swelling, and tightening so the damage to the ligament can heal. Let our team at Podiatry Associates, P.C. help you take care of your lower limb health, particularly for heel pain. Contact our offices in Castle Pines, Cherry Creek, and Parker, CO, through our website or by calling (303) 805-5156 for more information or an appointment. A heel spur is a bony bump that develops out of the larger heel bone when it is under frequent pressure. 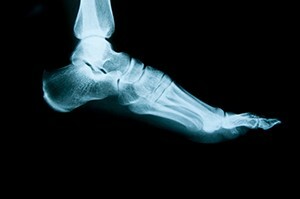 Stress on the heel bone over a period of time stimulates the body to create these hard lumps. Spurs can develop underneath the heel or on the back of it. Typically a spur underneath the heel bone is the result of chronic inflammation and pulling from the plantar fascia. On the back of the foot, it’s usually related to tightness in the Achilles tendon. A heel spur may or may not cause pain itself—but since it’s generally connected to an uncomfortable issue with soft tissue, the condition can become a problem for you. Typically, pain depends on how much pressure is placed on the back of the foot. Treatment usually revolves around reducing pressure on the heel and alleviating stress in the soft tissues around the spur. Let our team at Podiatry Associates, P.C. help you diagnose and deal with bony protrusions on your lower limbs. Use our online form or call (303) 805-5156 to make an appointment at our Castle Pines, Parker, or Cherry Creek CO offices. How is a heel spur treated? A heel spur may or may not need treatment, depending on how much it contributes to your foot’s discomfort. They don’t always cause pain. Generally speaking, though, a spur on the heel bone is related to a chronic and painful condition like plantar fasciitis. Conservative treatment that reduces the pressure on the heel and alleviates inflammation can be very helpful for minimizing and eliminating pain. Shoe changes and orthotics are among the most common treatments. Start wearing footwear with plenty of cushioning under the heel and adequate support through the arch. Orthotics can help provide extra padding and support for the foot. They can also correct any biomechanical issues that may have contributed to the problem. Icing the painful area may reduce inflammation in the soft tissues around the spur. Stretches can help minimize the pressure on the foot as well, which may help the discomfort. Only rarely does a spur need to be removed to deal with the problem. If you have chronic heel pain, let Podiatry Associates, P.C. in Castle Pines, Parker, and Cherry Creek, CO check for heel spurs. Make an appointment through our website or by calling (303) 805-5156. What will happen if I ignore my heel pain? If you don’t treat your heel pain early in its onset, it is much harder to resolve. The affected tissues become chronically inflamed and don’t respond as well to treatment. When you seek a remedy right away, we can usually cure heel pain with appropriate shoe choices, stretching, and custom orthotics. If you do put off getting help, however, don’t fret. Conservative treatments can still resolve your discomfort, though it may take longer and be more involved. Very rarely does anyone need surgery for heel pain—more than 95% of patients with the problem are healed using noninvasive measures. Don’t wait to have your heel pain resolved. Contact Podiatry Associates, P.C. for an appointment or more information on how to take care of your feet. You can reach our Castle Pines, Cherry Creek, and Parker locations by visiting our online contact page or calling (303) 805-5156. The vast majority of people with plantar fasciitis—more than 95%—will have their heel pain resolved without surgery. However, the condition does not fix itself. You may be concerned that your doctor will tell you to stay off your feet and give up your activities. Most people would rather just live with the pain than do that! Doing nothing isn’t the answer, though. That choice will only make your heel pain worse. You need intentional care. Treatment begins with the appropriate diagnosis by your podiatrist at Podiatry Associates, P.C. Next, a treatment plan will be designed for you that might include strappings, custom orthotics, physical therapy, stretching, and in rare cases, injections. After a while, your heel pain will resolve, and you’ll be able to resume the activities you enjoy. The key is early treatment. Contact Podiatry Associates, P.C. in Castle Pines, Cherry Creek, and Parker, CO to see how we can help your heels recover. Visit our online contact page or call (303) 805-5156 for an appointment or more information. Can high heels cause plantar fasciitis? Wearing high heels consistently can lead to the development of plantar fasciitis. Choosing to wear high heels all of the time causes your Achilles tendon to tighten. That then pulls on your heel bone, especially when you flatten out your feet again. This can also injure the plantar fascia. The key to recovering is to avoid wearing a heel higher than two inches for an extended period of time. Otherwise you will only injure the ligament further. Treatment should include stretching, custom orthotics that fit into dress shoes, and moderation in your footwear. The podiatrists and physical therapists at Podiatry Associates, P.C. can get you fitted for custom orthotics and will create a physical therapy routine designed to relieve your pain. If your shoe choices have left you with aching feet, you can still do something to change it. Don’t allow your feet a chance to get worse. Contact our offices in Castle Pines, Parker, or Cherry Creek today by calling (303) 805-5156 or by requesting an appointment online. Plantar fasciitis is the painful inflammation and swelling of the plantar fascia, which is a ligament on the bottom of your foot that starts in your heel and extends into your toes. Frequently the tissue becomes injured because this ligament does not stretch well. Strain on the foot pulls the ligament and strains it, causing discomfort. Age can make a difference as well. As we grow older, our feet flatten, which puts tension on that ligament and contributes to the injury. Usually the heel feels the worst after long periods of time either sitting or standing, so you may feel it when you get out of your car after a long day at work, or after you exercise. Don’t let heel pain keep you from doing what you love. You do not have to suffer from plantar fasciitis--we can help. Call Podiatry Associates, P.C. at (303) 805-5156 or schedule an appointment online for uncomfortable heels at our Cherry Creek, Castle Pines, or Parker, CO offices. There are many different causes of heel pain. These conditions include plantar fasciitis, Achilles tendinitis, tarsal tunnel syndrome, calcaneal apophysitis, and peroneal tendonitis. Each of these involves a structure that is attached to or affects the heel bone. For some reason or another, those tissues become injured or overworked and begin to hurt. The key to treating this pain begins with the correct diagnosis. You will need to have your feet examined by a professional, like those here at Podiatry Associates, P.C. They can determine what specific structures are affected and help you begin a path to recovery. Heel pain doesn’t usually improve on its own. You do need intentional care to repair the damage and allow your foot to heal. If you’re struggling with painful heels, contact Podiatry Associates, P.C. in Castle Pines, Parker, or Cherry Creek, CO for an appointment or more information. You can reach us by calling (303) 805-5156 or visiting the online contact page. If you have pain in your feet when you get out of bed in the morning you might be suffering from plantar fasciitis. Plantar fasciitis is a common cause of pain that develops on the bottom of your heel. It can occur in all ages, genders and in all foot types. To determine if plantar fascitis is the cause of your heel pain and what your treatment options are, contact our office today at 303-805-5156 to make an appointment with Dr. Oberholtzer-Classen at our Castle Pines, Cherry Creek, or Parker locations.